Adding sounds to your library that have been Shared by other Omnisphere users is simple! Omnisphere sounds that have been shared using the Sharing feature are conveniently collected into a single .omnisphere file. Files with the extension .omnipshere can be added to your library in a single operation. This feature handles the file management for you—without you ever having to leave Omnisphere. 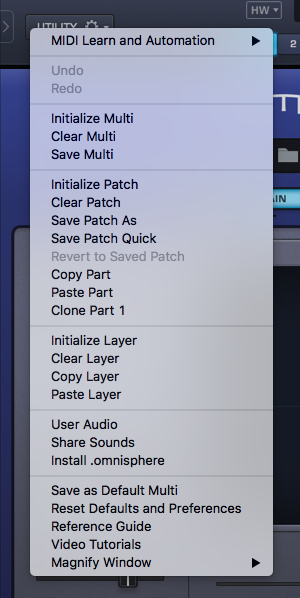 Once you’ve received the shared .omnisphere file, select “Install .omnisphere” in the Utility Menu. 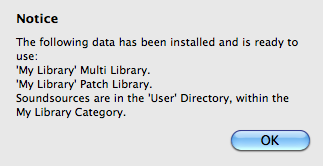 After selecting the .omnisphere file, you’ill get a report detailing the data contained in the package. After clicking OK, Omnisphere will display a confirmation letting you know where the new sounds have been installed.